The first part of the BJDcollectasy Halloween project shows how to make custom fabric for a project. The tutorial was assembled by doll fashion designer Charie Wilson. The project can be seen HERE. The outfit made from Charie’s material along with two other dolls dressed for Halloween by Spampy Stuff, will be shown next Sunday. New face-up project! This tutorial shows you how to face-up a Junga Toy skull. The skull is made to fit a variety of SD size dolls. The project is easy to do. Video tutorial can be found HERE. 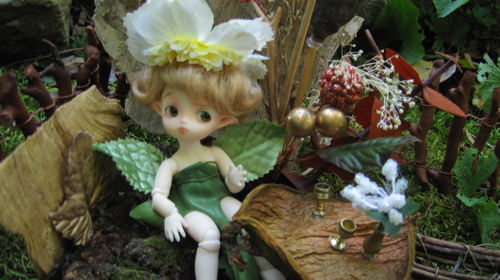 Article on some of the latest trends in smaller BJDs (under 30 cm tall). Check it out at BJDcollectasy HERE. 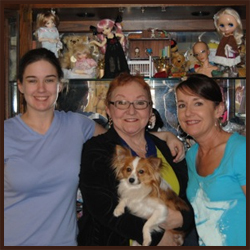 Dr. Judy of the Doll Peddlar shop writes about what it takes to prepare for running a sales table at a doll show. Lots of photos are included. Check out the article HERE. The new doll Mimi and both micro mini dolls Squee and Boo are open for pre-order at Luxour Academy. 10.5 cm tall Mimi is a limited edition. Her full name is Mimi the Fire Maiden. She is cast in white resin and will be sold as a basic doll with a pair of random color eyes and a free face-up. 5 cm tall Squee and Boo are both available in white resin. Each doll can be ordered with a choice from two heads (normal and giggle) or optionally both heads can be purchased with the dolls. A face-up for Squee and Boo dolls is also optionally available for an additional fee. All the dolls are designed and made by doll artist Donny Harijanto of Dream High Studio. Luxour Academy is the exclusive seller for the company’s dolls. Two-S Doll, a brand new Chinese company formed by a group of friends, was only launched a few months ago. The company will specialize exclusively in girl dolls. They released two dolls so far in the ‘Sweet’ Line, and they plan to expand that line and introduce two more doll lines by the end of this year. Check out the company HERE. Doll Leaves is a new company carrying 1/3 size boy dolls and two sizes of tiny dolls. The article about the company, their dolls, and their plans to expand their lines can be seen HERE. Doll Artist Kaye Wiggs demonstrates how she applies stripes to a KazeKidz Koneko Doll. The video can be seen HERE. Check out the new tiny from The Sleeping Elf! Everything about the new Doll Thistledown by Carrie Atwood can be found HERE.